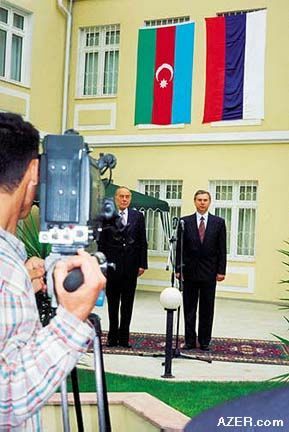 Since October 26, 1999, Vilayat Guliyev has served as Azerbaijan's Minister of Foreign Affairs. By profession, he's a professor and holds a doctorate in philological sciences. He has a passion for studying the historical development of Azerbaijani literature and social thought. Guliyev has authored ten books related to Azerbaijani literature and the Azerbaijani-Russian relations of the 19th and early 20th century. Since 1988 when the Nagorno-Karabakh conflict first broke out, he has played an active role in political affairs. He has served as a Member of Parliament (1996 to 2000) on numerous committees, many related to Foreign Affairs. Today Guliyev is on the road much of the time, helping to forge economic and political relations and foster friendships as part of what he describes as "an extremely difficult and demanding position." Despite the fact that my background in philological and historical research may seem far removed from what I'm doing today, I find many correlations. It goes without saying that, first of all, an effective politician must have a broad outlook and scope of knowledge. He must be a person who has a deep grasp of the spiritual wealth and culture of his own nation as well as that of numerous other nations. A politician cannot be confined simply to political doctrines and statements. If he wants to represent his nation with all its values in the true sense of the word, he has to have a great depth of knowledge. From this point of view, my knowledge of Azerbaijani, Turkish, Persian and Russian literatures and their respective cultures, of course, provides an enormous foundation for my political work today. It helps me to both represent my nation and build better communication with others. During this last year as Minister, I've seen how most of the foreign people who come to Azerbaijan bring with them misperceptions about our country. 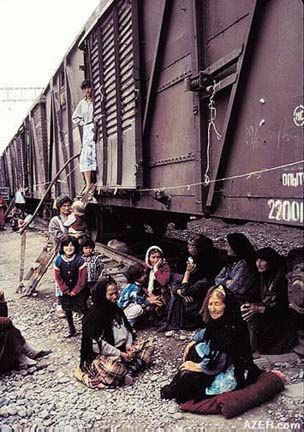 Left: Refugee women seek relief from the scorching summer heat under railway boxcars that have served as home for the past seven years. Azerbaijan's refugee population of nearly 1 million people is eager for a resolution to the war so they can return home to their towns and villages. Nearly 20 percent of Azerbaijan's territory is under Armenian military occupation. For example, they think that they are coming to a Third World country. But after they are familiar with Baku, see its architecture, become acquainted with our people and our rich history and culture, they realize that we are a nation with high European standards. For example, foreigners are usually surprised to discover that Azerbaijanis wrote the first opera as well as the first ballet in the Turkic-Muslim world. Azerbaijanis published the first newspaper among the Turkic-Muslim nations of the former Soviet empire. Azerbaijanis opened the first European-style schools in the region. Azerbaijanis set up the first European-style democratic republic (1918-1920) in the region. Foreigners are surprised when they become familiar with the cultural past of our nation. They soon realize the implications of what it has meant for our country to be situated at the crossroads between Europe and Asia. Because of our unique geopolitical situation, we've managed to synthesize and immortalize both Eastern and Western values. Knowing these issues well - which is my specialization - has more or less helped me in my work. But it's up to us to be economically strong enough to make our culture and past better known. Such misperceptions about our culture originate mostly in the West. Unfortunately, there's a tendency there to equate Islam with Islamic fundamentalism, or with separatism, or even with terrorism. I remember that when Armenian separatists started the problems in Nagorno-Karabakh in 1988, newspapers in the United States always tried to describe the cause of the conflict in one simplistic sentence. It was a carefully worded sentence that prejudiced American public opinion against Azerbaijanis. The newspapers wrote that the Nagorno-Karabakh issue was a conflict between Armenian Christians and Azerbaijani Muslims. Invariably, that one sentence was included in every story that was filed about the conflict. Unfortunately, such false impressions die hard. Today there is still a tendency among Westerners who are unaware of what is going on in this part of the world to side with the Armenian point of view, to be totally naive about the strategy of such propaganda. Westerners have a tendency to place blame on the Azerbaijanis because of their own religious Christian inclinations without investigating the reality of the situation. Left: Russia, too, now has its own embassy in Baku. President Aliyev (left) with Russian Chargé d'Affaires Alexandre Prishepov at the Russian national holiday in June 2000. Furthermore, in the Western world a certain prejudice exists not only against us, but also against the Ottoman Turks who have been integrated with Europe for several hundred years now. Of course, in order to stop this, to show ourselves to the world as we really are, we still have much work to do. And since we haven't done that yet, the fact that such erroneous notions exist is, of course, our own fault. We must carry a great deal of the blame. In your magazine, you've written several times about the Azerbaijan Democratic Republic (1918-1920). During those times, Alimardan bey Topchubashev, the head of that Democratic Republic's mission to Paris, was time and again writing to his government that they had signed contracts with various magazines in France, Switzerland and Germany. He urged the government to transfer a significant amount of money into the accounts of those magazines so that they could propagate Azerbaijan and make the country known. It's really a pity that during those times when Baku was so affluent with oil, our natural resources weren't put to use to serve the Azerbaijani nation. If we had started the process of making ourselves known in the 1920s, certainly now we wouldn't be dealing with these explanations set forth by the Armenians. Of course, these days the Armenian Diaspora is conducting strong propaganda against Azerbaijan. All these things create obstacles in making the truth known. Today our foreign policy is very different from ten years ago. Can you imagine that at the time when we gained our independence in 1991, Azerbaijan's Foreign Ministry only had 12 members. The diplomatic corps during the Soviet period emanated from the center - from Moscow. But today we have more than 250 members. Now Azerbaijan has embassies in 20 countries and five permanent representatives in international organizations, and our own flag flies above those embassies. Today, we are a full-fledged member of the United Nations, OSCE, UNESCO, GUUAM and numerous other international organizations. Soon we will be a full-fledged member of the Council of Europe. So much has happened these past ten years. And there are nearly 30 countries that have sent ambassadors or representatives here to Baku. On my last trip to the United States this month (September 2000), I observed that Americans had a much greater interest and much broader knowledge about our country than in 1995, when I was there for the first time. Back then, very few people among those I met had solid information about our country. During the Soviet period, only a few foreign experts knew about Azerbaijan. And very few foreign diplomats ever got the chance even to visit our country. When it comes to international relations, without a doubt, the oil projects initiated since late 1994 have been the driving force. This has led to strong relationships with the U.S., Great Britain, Norway, France, Japan, Saudi Arabia, Italy and Germany. Our latest oil contract was signed between the U.S. company Moncrief and SOCAR in September 2000 in Washington, D.C. It marked the 20th oil contract that we've signed in the past five years. These countries have already invested in our country and are cooperating economically with us. But now we are also seriously interested in developing the non-oil sector. Last year for the first time, approximately 60 percent of foreign investments were directed to the non-oil sector in areas such as agriculture, telecommunications and road construction. Also the construction sector is developing. We want to increase these activities. We've created a legislative basis for such cooperation. The Parliament (Milli Majlis) has adopted laws that meet European standards; however, we have yet to implement these laws to the extent that they should be. Admittedly, we have yet to "turn on the green light" for all those who wish to invest in the country. But we're working on it. It's a pity that bribery, corruption and bureaucracy still put obstacles in the way. Up until now I'm the fourth person to hold this position as Minister of Foreign Affairs in independent Azerbaijan [since late 1991]. Whether or not I'm successful in this undertaking, I'm already a part of history. This, of course, puts a heavy responsibility on me. Sometimes, I get surprised how the course of my life has changed so dramatically in the past decade. Sometimes it's hard for me to get used to my new position, to my new role and function. But still it's a great honor for me to take on these responsibilities; I've written books about individuals who sacrificed their lives for Azerbaijan, who worked for the promotion of this country, who opened schools, who developed the culture, who tried to turn this nation into an independent country. And now fate and history have created an opportunity for me also to play a role. Of course, one of the most serious problems that we are dealing with now is the resolution of Nagorno-Karabakh conflict. To tell you the truth, it's difficult for me to talk about Karabakh because I'm from there myself. Of course, I left my native village some 30 years ago after finishing secondary school. But it's still home to me. My relatives were still living there before the war broke out. The problem of Karabakh is a very complicated issue. Unfortunately today, the solution doesn't depend upon Azerbaijan alone, as the problem has become an issue that many major states are concerned about. The national interests of other countries have very much complicated the solution. Late last year, Armenia was pursuing an independent foreign policy - at least to a certain degree. They indicated that they were prepared to take radical steps in solving the Karabakh problem. On Oct. 27, 1999, terrorists attacked the Armenian Parliament and killed seven Parliament members, including the Speaker, Vice-Speaker and Prime Minister. Clearly, this attack meant that they would not be able to solve the conflict, independent of Russia. Kocharyan [President of Armenia] became an absolutely different person after that attack. Up until then, it seemed that he was ready to make certain compromises to resolve the problem as quickly as possible. But now he is absolutely reneging on the promises that he made. But if peace could come to this region, it would be beneficial not only for Azerbaijan, but also for the entire Southern Caucasus. Azerbaijan has a very important role to play in this region. If there were peace, Azerbaijan would provide the corridor between Asia and Europe. Armenia itself could take advantage of this situation. If there were peace, the Baku-Jeyhan pipeline could pass through Armenia's territory. But after this pipeline is laid down, it will be Georgia that serves as the transit country and will annually draw $55 million just from the oil transport costs alone. If there were peace, a very important transport artery - the railway line to Kars [Turkey] could be set into motion from Azerbaijan through Armenia and on to cities in Turkey and Europe. This, of course, would bring great economic development to the region. If the conflict were to be resolved, Turkey would open its borders with Armenia, and this would stimulate Armenia's development. It goes without saying that Azerbaijan's natural resources and its geopolitical position would benefit both Armenia and Georgia. But as long as the problem of Nagorno-Karabakh exists, neither the Armenian Diaspora nor other foreign investors will take Armenia or Azerbaijan seriously. Nobody wants to risk his money if there's a chance that military conflicts will flare up. If this conflict didn't exist, more capital would already have been invested in Azerbaijan than what we have today. Until Armenia arrives at an understanding with Azerbaijan, it won't develop economically. And the Diaspora that they rely on won't give them the aid that they expect and need. During President Kocharyan's recent visit to the U.S, he asked for help from the Armenian Diaspora, but they were very cold to him. The Armenian mass media wrote about it. The Diaspora advised the President to create order in Armenia first and to take advantage of Armenia's resources. Back in 1988-1990 when that conflict first started, the Armenians were saying that Azerbaijanis hadn't paid enough attention to Karabakh, that it had become a backward region, but that they would soon turn it into the Switzerland of the Caucasus. They said wealthy people from all over the world would be attracted to invest capital there. Ten years have passed, but Karabakh has not become a second Switzerland. Nor will it become one. On the contrary. The population in Karabakh before the conflict included 120,000 Armenians and more than 50,000 Azerbaijanis. Today there are no more than 40,000 Armenians living there. And the truth is that those who still live there are trying to find every means to leave. Emigration is one of the most serious problems that Armenia faces today. So many of their people are trying to leave. I personally believe that there must be a great number of Armenians today who are sorry that they got involved with these political speculations and became the victims of major geopolitical games. Naturally, the fact that Azerbaijan is a small country surrounded by large countries creates major problems for us. Iran has its own interests, and a number of circles in Russia still haven't forgotten that Azerbaijan once belonged to the czarist empire and then later the Soviet Union. That means that Azerbaijan must always be clever not to become oppressed by these big neighbors. We are always keen to maintain peaceful neighborly relations with both Russia and Iran. Since Azerbaijan gained its independence, enormous work has gone into this aspect of our foreign policy. One of our classic poets once wrote that small nations need big swords to defend themselves. But another poet contradicted him, saying that small nations need big friends so they can rely on them to ensure security. My opinion is that we must have both mighty swords and mighty friends to ensure our future security and progress. I think these ten years of independence have instilled within us the belief that we definitely have to be strong, both from the economic as well as the moral-psychological point of view. Strength is not in the sword alone. We must become a nation that believes in itself and in its own power. If we could have that, we could solve all our problems, including Karabakh. This interview was conducted by Betty Blair, Editor of Azerbaijan International, in the office of the Minister of Foreign Affairs in Baku on September 20, 2000.